As snow and icy conditions approach, car buyers start thinking about improving their odds on the road with Nissan’s AWD, 4WD vehicles. Experts at Speedcraft Nissan can help you decide which drivetrain is the better option and which Nissan model to choose. Both of these options are distinct from front and rear-wheel drive, which use only two wheels to propel a vehicle. All the car’s wheels are employed using AWD (all-wheel drive) and 4WD (four-wheel drive), which comes in handy during unpredictable New England weather. Drivers like the added control and traction when torque is displaced to all the tires. That added torque and traction is also helpful for hauling and towing. AWD – A drivetrain that employs a front, rear and center differential to provide power to all four wheels of a vehicle. 4WD – A drivetrain that employs two differentials and a transfer case to provide power to all four wheels of a vehicle. With AWD, an electronic sensor sends the power to all four wheels and determines when all the wheels are needed. With 4WD, the driver is in charge of manually putting all four wheels to work by flipping a switch within the vehicle. At Speedcraft Nissan, generally speaking, AWD is available in midsize SUVs and crossovers, and 4WD is available mostly for the large SUVs or pickup trucks for added power. An AWD or 4WD vehicle can accelerate better than a two-wheel-drive vehicle in inclement weather because the traction is equally distributed among all four tires. On a front-wheel drive vehicle, only two tires are doing the work. Also, he improved traction will lessen chances of getting stuck. When towing, a 4WD truck can pull a boat from a wet, steep boat ramp, for example, Edmunds says. Resale value is boosted for vehicles with AWD or 4WD in areas with tough winters too. The biggest downside to AWD or 4WD is overconfidence. Having AWD or 4WD does not mean you can drive in the snow or rain as easily as you would on a dry road. AWD and 4WD help only with acceleration and traction. Braking distances and handling don’t change. Nissan offers many options for those who are looking for a different drivetrain than the usual front-wheel or rear-wheel drive. Want to learn more about one of these Nissan models? 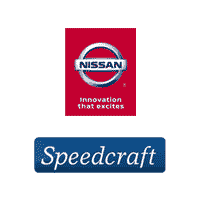 Contact our helpful experts at Speedcraft Nissan today. 0 comment(s) so far on Which Nissan Models Have AWD, 4WD?